Spring has sprung! That means the 2019 Kentucky Derby is right around the corner! If you plan on attending and find yourself stumped for outfit inspo, we are here to help. For such a joyfully Southern (and hopefully sunny) day, it’s all about color. There is no better way to stand out in the crowd at Churchhill Downs than to wear something bold and full of delight. Inspired by the Derby’s official flower, the Rose, we opted for a red infused look that reminds us of the dozens of buds found on the winning garland. Inspired by a trip to The Cloisters, Oscar de la Renta’s latest collection was awash with decorative floral prints and embroideries that spoke to the label’s elegant romanticism. This scarlet botanical embroidered dress is crafted from silk and features a round neck, a concealed front fastening, half sleeves, a flared skirt and is knee length. Since we have such a spirited dress, the shoes need to be chic and understated. Stuart Weitzman’s signature ‘Nudist Song’ sandals are made from sleek leather. Detailed with two slim straps, they are set on a 90mm heel and have a cushioned insole for comfort. In lieu of jewelry, we decided to incorporate a little sparkle via our bag. There is no better way to pay tribute to this time honored tradition than with a beautiful nod to thoroughbreds. This elegant Judith Leiber clutch is made entirely of bronze crystals and polished gold hardware with a charming and endearing composition that will warm the heart of any horse lover. The most important piece in any gal’s Derby day look is easily her hat. 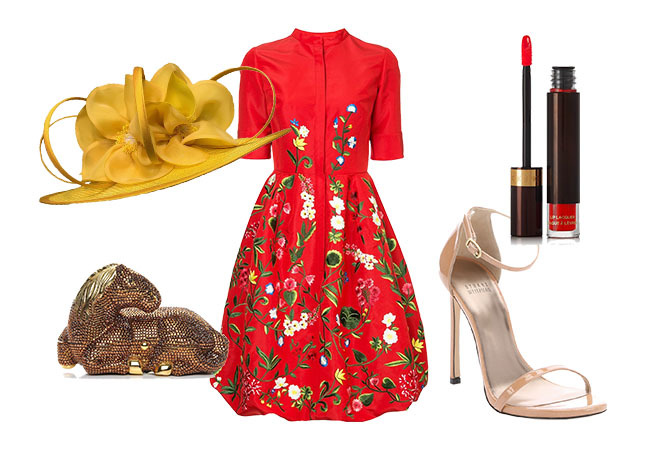 For the 2nd year in a row, designer Christine A. Moore has been named the “Featured Milliner of Kentucky Derby 145.” Her “Lovely’ creation brings out the sunny shades of yellow in the dress, not to mention a touch of drama to our overall ensemble. Crafted with a parisisol broad oval brim with hand cut and sewn silk and silk organza petals, the inspiration behind this piece was the new blooms of early spring. Last but not least, we wrapped things up with a shiny, classic red lip courtesy of Tom Ford Beauty. Combining the long- wearing texture of a stain with the high shine finish of a gloss, this pigmented formula is enriched with moisturizers to keep lips feeling soft and plump. No matter which horse you end up rooting for, this outfit’s ‘Winning Colors’ is sure to make you one lucky lady.